Noted harmonic double act, the Everly Brothers, once sang a rather lyrical and longing melody called ‘Love Hurts’. And even though this current creative team wasn’t born when this song was being sung, they still have managed to mirror this sentiment, as reflected in this tale that they have transcribed. And who is this creative team I am referring too? Why Writer: Tony Bedard; Artist; Daniel Hdr; and ailing Publisher: DC Comics of course – all in August 2011. 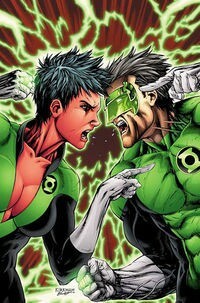 At the moment, Green Lantern, Kyle Rayner , is somewhat reflective with his station in life. He is reflective about how he lied to Soranik about his alleged love for her, when Star Sapphire, Miri, aided them with a past venture. And he is also reflective about the death of Mogo now, and recounts this to his cohort, Tomar-Tu , whilst alighting in space. Then suddenly, out of nowhere, Miri turns up, before transporting herself, Kyle, Tomar, plus Sorianik, to her ravaged planet in sector 1852. Now I am sure that you are wondering why Miri would be doing something unsuspected like this? And on top of that, why does she start causing havoc to all in sundry once she arrives on this planet? Possession by an outside force? Anger due to Tomar’s presence? Or is it all to do with love? Hmm – the last one – as this ploy inadvertently tips Kyles hand, and forces him to reveal to Sornanik his true feelings toward her. Ooop! Love hurts , right? Now we are delving into emotional territory here where this particular issue of Green Lantern Corps is concerned. As in essence, what it is trying to do, is tackle a very common problem – love, and the loss love – and then translate it into a rather elaborate and science fiction type way. OK, I have to admit, normally, this type of tale does not always sit too well with me – as it takes a logical pretext, and transposes it upon an illogical one. However, what writer – Tony Bedard – and artist – Daniel Hdr – have manages to do in this issue, is make the unbelievably real, into believably unreal. Ohh! Ambiguous statement alert, huh! What do I mean by ‘believable unreal’? Well, a good way for me to describe this to you, is by describing what this issue means to me on a conceptual level, OK? (1) Kyle has a dilemma that is plaguing his mind. (2) Another problem rears its head. And (3) This subsequent problem, inadvertently helps him bring to the fore his initial dilemma. Do you see what I am getting at? As on a baser level, you can understand what is exactly happing to Kyle – and associate with his ‘adventure’ relating to your own life. As for all that other stuff – like space, aliens, and dieing sentient planets – this comes under the category of ‘candy-floss ’ or ‘back story’... which ever you prefer. All in all I really did dig this issue (and it would be nice if you did dig it as well, ha! ), as the tale was simplistic, relatable, and emotional, and the art was also simplistic, with extra added dynamism. Bravo, Bedard and Hds (Is Hds a man or a woman?) as once again you have produced a top quality stand-alone issue which is both personable and valiant. Hey, do you agree with any of the sh*t that comes dribbling out of my mouth? If so – please feel free to try and sell me Viagra and a timeshare on the moon. Love you.